The tragedy in Nepal has already claimed more than 6,000 lives, but some experts believe the total death count could be as much as 10 times that. Minor aftershocks could also continue into the coming weeks, but they won’t cause damage anywhere near the scale of the initial quake. However, another threat, just as fatal, looms over Nepal in the coming months—landslides. Landslides and mudslides are a perennial problem for Nepal, whose proximity to the Bay of Bengal makes it subject to heavy rainfall during the summer season. Indeed, the term “monsoon” was introduced to the English language by British colonists in India. Immediately after the earthquake, landslides erupted across the country—remote villages were trapped and hundreds are missing as a result, but the worst may be yet to come. The earthquake destabilized Nepal’s surface terrain, and across the country hilltops and valleys are landslides waiting to happen. The earthquake destabilized Nepal’s surface terrain, and across the country hilltops and valleys affected by it are landslides waiting to happen—all they need is rain, and monsoon season is only a month away. 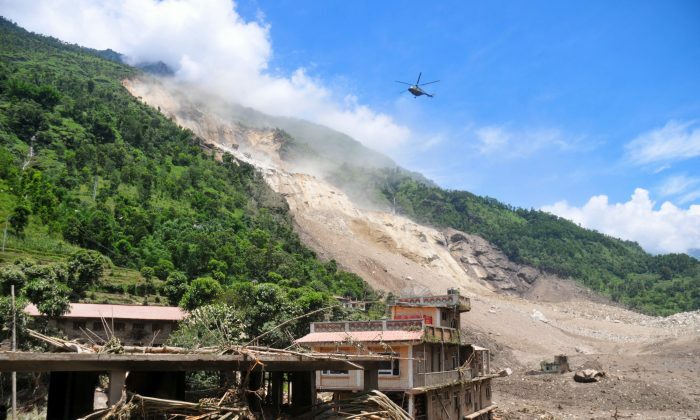 Fortunately, geologists have already developed advanced topography models that can assess the risk factor of an area for landslides after an earthquake, so the Nepalese can evacuate areas near hills that are expected to collapse. A team of researchers—the technical term is geomorphologists—at the University of Michigan were able to run a simulation of the earthquake in Nepal on the day it happened, and they have sent their analysis to the U.S. Geological Survey and other U.S. agencies for further use. The initial simulation was based on topographical data collected by the Shuttle Radar Topography Mission (SRTM) in 2009, which used satellite data to generate an extremely high-resolution digital model of the earth’s surface between 60 degrees north and 56 degrees south of the equator. The researchers then input the seismological data gathered from the earthquake itself—the magnitude, depth, and location—to calculate the geometric spreading factor, which is then used to model how the seismic waves move outward from the epicenter. That, combined with the data of slope steepness from the SRTM and estimated rigidity of rocks, yielded the “at risk” areas. The report mapped the areas of Nepal that were the most vulnerable to future landslides, and also made recommendations to the U.S. government for which areas need further data gathering by satellites. The parts of Nepal most vulnerable to landslides run along the Nepal–Tibet border and above the fault rupture, west of Mount Everest, and 17,550 square miles of places that are above 8,200 feet. Also at risk are areas close to rivers. Landslides can build up and form artificial dams and thereby flood villages nearby. If a landslide dams up a river, solving the problem can be a lengthy and complicated process. If a landslide dams up a river, solving the problem can be a lengthy and complicated process. In July 2014, a landslide killed 156 people and clogged the path of the Sunkoshi River, forming a giant pool of water threatening to flood the villages downstream. The Nepalese army dynamited the landslide and then set to work digging a canal. It took the army a full 45 days to carve a new path for the river, finally completing the canal on Sept. 4, 2014. The landslides weren’t caused by an earthquake, but by the rain. The team had to take special care when preparing their report so that it was intelligible to laymen who could use it as a practical guide in humanitarian missions on the ground. The report included a map that colored Nepal on a gradient from blue to red—red denoting high risk, and blue low risk. “We had to make the product readable to people who weren’t specialists in my field, so it’s obvious when you look at it,” Gallen said. The urgent nature of the matter and the dearth of information about the capacity of rescue efforts on the ground means that Gallen and others didn’t decide on a certain cut-off point for landslide risk to justify evacuation, settling for mapping the risks on a continuum. 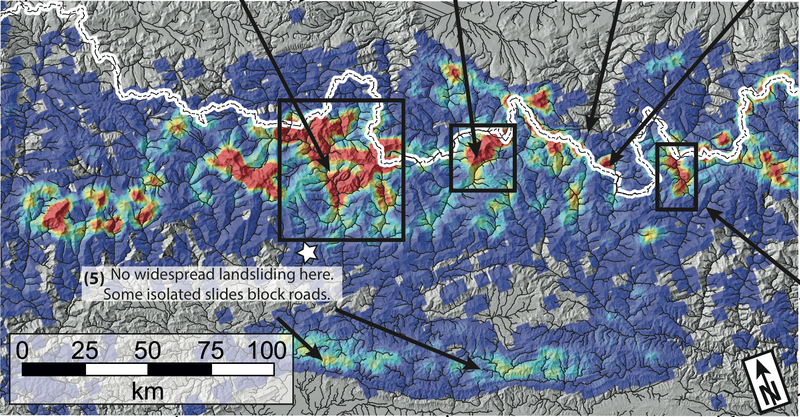 The mapping of all the landslide hotspots in Nepal is part of an ongoing process—satellites are still gathering fresh data that will yield updated, more accurate models. The process itself isn’t seamless either; many areas affected by the earthquake are covered by cloud, which interferes with the satellites. The landscape will also likely be disrupted by aftershocks—a 5.1-magnitude quake transpired in the early morning of May 2, a week after the initial quake. Though simple in concept, gathering satellite imagery on a specific target requires complex international coordination, given that there are literally thousands of satellites in orbit operated by different countries. Clark is scheduled to meet with NASA to discuss the diversion paths for the satellites, as well as potential collaborators. The sudden thrust that caused the tragedy of the Nepal earthquake on April 25 occurred about nine miles underground beneath the Himalayas. The earthquake in Nepal has left thousands dead, and tens of thousands injured, flooding local hospitals with patients and leaving them overwhelmed.